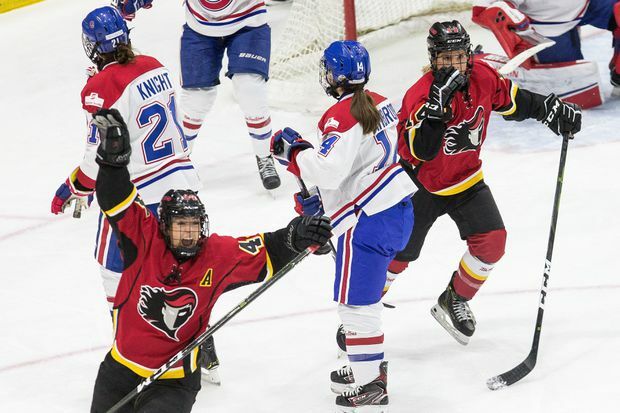 Zoe Hickel, bottom left, celebrates after scoring her team's opening goal against Les Canadiennes de Montreal during the first period of the 2019 Clarkson Cup on Sunday. The Calgary Inferno hoisted the Clarkson Cup trophy and celebrated as Canadian Women’s Hockey League champions on Sunday after defeating Les Canadiennes de Montreal. Zoe Hickel led the way with two goals to help Calgary beat Montreal 5-2 before a crowd of 4,695 inside 7,700-seat Coca-Cola Coliseum in Toronto. Calgary had nine Olympians and Montreal had six. However, there was one very important woman missing from action – arguably the world’s best female player: Canadian Olympic star and Montreal captain Marie-Philip Poulin. She led the CWHL in scoring this season (23 goals, 27 assists), was voted league MVP by team coaches and general managers and also won the Jayna Hefford Trophy, as voted by her peers. Poulin skated in the warm-up but then stayed on the bench in full gear. She cheered, coached teammates, worked the door and banged on the boards. Perhaps the most clutch scorer in women’s hockey – author of winning goals in the gold-medal games at the 2014 and 2010 Olympics – never took a shift. She had not played in the three-game semi-final series against the Markham Thunder earlier this month, sidelined with an unspecified lower-body injury. It remains unclear whether Poulin will be ready to play at the IIHF women’s world hockey championship, set for April 4 to 14 in Espoo, Finland. It was the third time in the past four years these two CWHL powerhouses had met in the final, with Calgary winning in 2016 and Montreal in 2017. Calgary struck twice in the first period. The first when Katelyn Gosling fired a shot from the point, which Hickel tipped in. Five minutes later, Halli Krzyzaniak netted a bullet through traffic. Outshot 11-6 in the first period, Les Canadiennes came out firing in the second. Ann-Sophie Bettez – a 31-year-old about to make her first appearance for Canada in a world championship – backhanded a goal past Calgary’s CWHL goalie of the year Alex Rigsby to make it 2-1. Brianna Decker swiftly helped the Inferno regain the two-goal advantage by ripping one in on the power play. She and fellow U.S. Olympian Kacey Bellamy signed in Calgary this season in free agency to play their club hockey with some Canadian Olympians. Then Montreal scored the craftiest goal of the day to that point. U.S. Olympic standout Hilary Knight noodled the puck between her legs and across the mouth of the net to Bettez, who buried it. Just 30 seconds into the third period, Jill Saulnier scored what Montreal believed was the tying goal, but officials waved it off. Knight had landed on top of Rigbsy on the play. Les Canadiennes argued passionately – to no avail – that she’d been pushed. Poulin tossed up her arms in exasperation on the bench. Instead of the game getting closer, Calgary then took it the other way. Hickel netted her second after some wily give-and-go between her and Rebecca Johnston. Then, Johnston tapped in a late empty-netter. “Everyone is screaming, yelling and dancing,” Johnston said after coming out of Calgary’s dressing room. Then the Canadian forward was asked about her CWHL foe and Canadian teammate, Poulin. Hickel, a native of Anchorage, Alaska, was a runner-up last year when she was with the CWHL expansion team based in China, Kunlun Red Star. Decker, a U.S. Olympian – was the game’s MVP. It was a battle of Olympic goalies – Team USA’s Rigsby made 25 saves for Calgary while Canada’s Emerance Maschmeyer turned aside 26 shots in the loss. The confusion that surrounds the future of the professional women’s hockey remained palpable on Sunday. The world’s top players are scattered throughout two pro leagues and there is a broad desire for one league, preferably one co-operating with the NHL. The competing National Women’s Hockey League held its championship game last weekend – the Isobel Cup – in St. Paul, Minn. Both league commissioners have called a merge inevitable, but neither has given many specifics about when it could happen or what it could look like. Decker offered one succinct thought about a singular pro league would be like.